Wicker Living is a leading supplier of outdoor wicker furniture including Lloyd Flanders® Lloyd Loom® and Lloyd Vinyl wicker and custom replacement cushions. Our wicker furniture products are designed, engineered and manufactured by experienced industry craftsmen ensuring high quality comfortable furniture and replacement cushions. Our wicker furniture is elegant and can be used as outdoor wicker furniture or indoor furniture. You can expect our products to last for many years providing you care for them properly. Furniture selections are available from traditional wicker styles to today's modern styles. Choose from indoor/outdoor seating, dining table sets and decor wicker products. Tables, chairs, sofas and many other outdoor wicker patio furniture products are available in a wide variety of color finishes. Both standard wicker and deep seating wicker furniture used outside must meet quality material specifications. This is a requirement so that it can withstand extreme weather conditions and resist the suns deteriorating ultraviolet light effects such as fading and the resin becoming brittle. Ultimately, quality materials and craftsmanship make our wicker remain in good condition and last longer. Our wicker furniture frames and cushions meet these stringent requirements. Outdoor wicker furniture falls into three classes of wicker furniture. Natural Wicker is one of the original types of wicker furniture and processes used to make outdoor furniture. It uses natural wicker reed derived from the rattan vine that is woven and stapled onto rattan frames. All organic materials subject to mold, mildew, rot and discoloration when used outdoors. This was the best wicker that could be used through the early years until better materials came along that were not as susceptible to undesirable climate conditions. Natural wicker is considered indoor wicker in most areas because it does not hold up well in undesirable climates. Resin Wicker, also known by many other names such as vinyl wicker, plastic wicker, all-weather wicker, outdoor wicker or modern wicker is derived from a plastic resin material. Not all the resins used for this type of furniture are of equal quality. The wicker reed made from resin is extruded into long reeds then it is hand woven over metal frames. Where necessary, the reed is stapled onto the metal frames to keep it in place. Lloyd Loom Wicker is and extremely high quality wicker furniture made via a refined manufacturing process only manufactured by Llloyd Flanders in Menominee, Michigan. This fully matured process was developed initially in 1916 as an alternative to hand weaving natural or resin wicker. 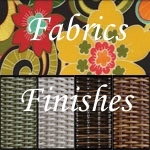 Today, it is considered one of the most state-of-the-art wicker processes available. The Lloyd Loom process takes cellulose strands and twists them into long cords. As many as 50 or more cords are used in the loom weaving process. These cords are woven by machine into a sheet of woven loom fabric. In lieu of weaving wicker reed by hand, these sheets of woven wicker material are cut and stapled to the metal frames then trimmed with decorative woven trim pieces that are stapled onto the frames making the seams and edges look very professional. The Loom wicker is then finished with two coats of polyester resin based paint that is flexible and durable. It coats the furniture beautifully. The end result is a high quality piece of wicker furniture that is capable of withstanding the harsh outdoor environmental conditions in addition to being elegant enough wicker furniture that it can be indoors as well. Whether it be Loom, vinyl or natural wicker, our furniture products are crafted by experienced craftsmen ensuring high quality wicker furniture and replacement cushions. Standard Wicker and Deep Seating Wicker are different. This is something you need to understand when you shop for furniture. You need to know what you can do with each type of furniture. Standard Wicker is wicker that has been designed to be used with no cushions or at the most just a seat cushion. For most people, if you try to use back cushions on standard wicker, you will find that your legs will be sticking out over the front edge and you will be uncomfortable. Thats because the seat depth of about 18-19 inches is short as compared to deep seating wicker. The seats are usually woven wicker so you can use the seat without cushions. Deep Seating Wicker is wicker that has been designed so that you absolutely need seat and back cushions to use it Typically, deep seating wicker uses at minimum, 4-5 inch thick seat and back cushions. the seat depths from front to back are on the order of 24 inches deep or more. 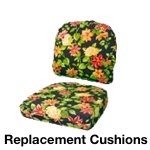 The depth provides ample space for a thick back cushion. The seat usually consists of a suspension strap frame and a foam type cushion that sits on top of the suspension strap frame. Without the cushion, you could not sit on the seat. Unlike standard wicker, you would sit on the suspension frame that would be very uncomfortable. Sling Furniture is the latest fad in patio and pool furniture. Sling furniture is an easy peasy furniture style that is for the folks on the go or for someone who wants any easy light weight set of furniture to deal with. 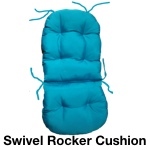 No need for cushion and it dries very quickly after rain or from wet bathing suits. Sling furniture is furniture designed with metal frames and fabric suspended and stretched across the frame. Wicker Living does not just sell wicker furniture cushions, we specializes in making custom made wicker replacement cushions and throw pillows for inside and outdoor wicker furniture. We make all cushions & pillows from scratch using your choice of fabric. 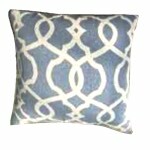 We have standard sizes and styles of cushions and pillows for you to choose form. But when you need something special, we can replicate your existing style of furniture cushions or make one exactly as you specify. You can choose from hundreds of available indoor, all-weather or Sunbrella® fabrics. 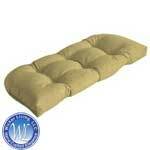 Wicker Living guarantees that you will not receive better customer service anywhere. Try us out and see.